I find it amusing how the conservatives are in such an apoplectic fit because Democrats voted for Thad Cochran in the Republican run-off in Mississippi. The mere fact that there is anger in the conservative media and that they are freaking out over the thought of blacks voting reveals the true ideology of the tea party and modern “conservatism”. He goes on to call Democrats voting in the primary as “dozens of voting irregularities”. So basically the act of minorities exercising their legal and constitutional rights is to be considered criminal or irregular. He tells us this country was built by conservatives for conservatives (even though the conservatives of the revolutionary war were the Tories and were on England’s side…but I digress). It is clear from McDaniel’s non-concession speech which was delivered in a homiletic cadence that is reminiscent (ironically) of African-American preachers, that “conservatives” means “whites” and liberal democrats means “blacks” and that conservative movement is code word for “white supremacy”. Hence, within this context, any cooperation with the Democrats (particularly this president) is a betrayal of the cultural, religious, racial and social construct (hegemony) that these reactionary conservatives are trying to establish or maintain. We now see the true nature of the beast….there is no more hiding. Democrats need to adjust and realize that we are in a war for the soul of the country and these desperate people will not go away. And we must acknowledge that there are more of them than we think. In fact, we may be dealing with as much as 47% of the voting population (Romney voters). Hence, this Tea party group will do anything; including undermine our democracy by literally shredding the constitution through the denial of basic civil liberties, to obtain their goals. And they will not compromise. We have been warned. People like McDaniel only serve to widen the already almost impenetrable breach between the left and right. Now, where we can never hope to agree on all, we can always hope to discuss the issues at hand. I’m sickened by the rights insistence that they are the only ones to whom our country should answer. Instead, I only wish that those despicable sorry…can’t help myself) who represent the “Tea party” that they will begin to understand that we need to TALK not dictate. “… by once again reaching across the aisles, by once again compromising and by once again abandoning the conservative movement.” I couldn’t believe it when I saw him say that on the news. The GOTP b*tch and moan about our POTUS acting like a king but if you are unwilling to “reach across at the aisle” or “compromise”, isn’t that the same thing as “do it my way or nothing”? Isn’t that like being a dictator? Childers needs to get his act together and quickly (his website needs work -- some info on policy positions would be a useful addition plus a more substantial bio) if he’s to take advantage of this situation. There’s another winning aspect to this too. Cochran managed to get out the Democratic African American vote to boost his numbers just enough to beat McDaniel conclusively. 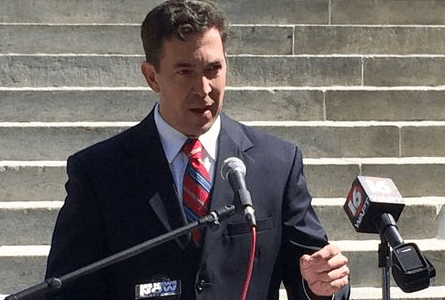 Those votes will now revert back to Childers and away from Cochran who can no longer depend on the tea party vote to get him across the line in the general. McDaniel voters are vowing to either vote for Childers or stay home. It’s unlikely that a Cochran loss would have proved to have been such a gift to the Democrats as this! Mopshell, you make a great observation. I think that some of the TPers will stay home. There is alot of anger among tpers in mississippi and nationally that Cochran relied on Black voters. They are treating it as if Cochran committed an unholy sin worthy of eternal damnation. Also McDaniel is not going away. He announced yesterday that he found over a “1000 voting irregularities. He is going to challenge the election results by trying to invalidate all voting in black areas. That will antagonize black voters and inspire them to come out in force in the generals. In fact the Mississippi primaries have allegedly inspired blacks who are marginalized in other southern states to vote in the open primaries in order to stop TP-candidates. This midterm is getting interesting…………..
Mopshell, we have not met yet so welcome to the Planet. Wouldn’t it be wonderful if the Dem won in the general election! We need to get the House back and a win there would help. Thank you for the welcome -- it’s lovely to meet you! If Childers wins, it will be one of the most unexpected wins of the midterms and I really think he has a chance! There are also 2 or 3 races in Kansas (where they’re fed up with Republicans) that might also go our way. Chris McDaniel thought he was going to be the next Ted Cruz. Instead, he’s out of the race, and throwing a fit about it. I suppose he could show up on Fox soon as their Southern Strategy Analyst. Even Fox might well be concerned about keeping this one in line -- especially since he’s now drawn a line in the sand between the tea party and the GOP. Fox may be worried about his treatment of their Republicans establishment darlings. I recognize your avi from Huff Post! I’m so pleased to see you here! Racist white folks crack me up…their apoplexy is epic. Is Mississippi trying to go backwards in time to the days of the KKK? Are they that racist or is it just a few tea party fools making a lot of noise? SO what is he saying about HIS side. c) They have an agenda defined by the TP wing of the GOP. And then he cites Reagan nine times. Reagan who with the Dem leadership in the House and Senate working with the GOP leadership there shaped a series of major policy initiatives. McDaniels might want to check out Reagans stance on social policy- he would not agree with the likes of the would-be Senator. Their GOP, their Reagan, their Lincoln are mythic and thus unreal. Acts like McDaniels when gathered into the national narrative being crafted by the GOP as a whole should be cause enough for the thinking, the aware to turn their backs on this obnoxious brand of conservatism. “SO what is he saying about HIS side. Makes it abundantly clear that the interest in these folks is to Rule, not govern. They are intolerant of others opinions and needs thus they really are intolerant of democracy. What was that quote/warning about America’s fall will come wrapped in a flag and bearing a cross…? And in order to rule, they have to do everything they can to interfere with the governance of the other party. Such interference keeps the Democrats from getting much of anything done (which they could use to build the case for their continued leaderhip) AND, perversely, becomes a way for the GOP to attack the Dems for not getting anything done. Ruling implies “ruling over” another but for whose good. Typically the rulers rule for themselves and their allies. You are correct Murph. Indeed, the other lesson is that no true conservative will compromise. They see the world as a zero-sums game. Hence expansion of gay rights, maintaining civil rights and the existence of social programs (which are viewed as not benefiting the right people) are viewed as a taking away of rights and privileges from the conservatives and their social order. I think we democrats all thought that these folks were just the run of the mill politicians who would chant no compromise to get elected and then make back room deals to govern. This is not the case, they really want to deconstruct the government and bring back the articles of confederation (which the founders realized was a disaster) or the “original constitution” which means the one without the 14th amendment. We need a GOTV like we never had before for 2014. That is what I will be doing this Summer and Fall: registration and GOTVing. P.S. Keep on posting. Your insights are sharp, your writing clear and your interaction sharp. You will build a following. Coservatives hold to traditional attitudes and values and cautious about change or innovation, typically in relation to politics or religion. Reactionaries are considered to be one end of a political spectrum whose opposite pole is radicalism; an extreme conservative; an opponent of progress or liberalism. They are defined mostly in terms of what they react against, what they oppose. They are, by intention, obstructionists. This is neoconservativism applied to matters both domestic and foreign. They are by nature zealots and thus incapable of deep or abiding compromise (using apparent compromise as a tactic leading to a long term win). In other words……what you said! CD, if we don’t get our people out to vote in the midterm elections we will have at least two more years of do nothing congress. Nice writing. He hasn’t conceded so there was no concession speech (yet). The thing that really gets me, is the photos of Cochran’s wife and the late night courthouse hijinks of his staff. This man stinks to high heaven and he’s squawking about losing out from crossover votes. Someone needs to tell this man that you need much thicker skin if you want to be in politics. And if you’re gonna throw stones, make sure you don’t live in a glass house. Seems to me that someone needs to point out that his negative actions were really what caused him to lose. And no one likes a sore loser. Especially one that runs a negative campaign. And what has been shameful is how some GOPers on the TV have not called out McDaniel on his dirty tricks and his racial and misogynistic behavior. They are more outrage over democrats voting for Cochran than McDaniel’s sleazy behavior. I know it is taboo to compare anything to the happenings of 1930s Germany. However in reality if you read about the tactics used by the national socialist party, one would see that there is strong similarities between the behaviors of the fascists and the GOP from propaganda, to scapegoating, to marginalization, to the creation of a pseudo religion. In the 30s it was based on the old Teutonic myths while in the 2010s, it is the bastardization of Christianity (essentially Christian Identity). Not just strong similarities, taking the same same game plan and running with it. Normally 1930s German comparisons send me into a tizzy. I have family that are Holocaust survivors and I’ve seen my share of numbered tatoos. The Rs aren’t just going after one group as Hitler did, they’re going after all of us. As to them hijacking Christianity, where are all the real Christian leaders? They should be shouting from the rooftops. “The Tea Party is a racist problem in this nation and we need to get rid of it.” This is a statement made by Leonard Zeskind, a human rights activist. Zeskind also said this at a recent conference in Wisconsin: “There’s been a recent academic study, and I say academic because people here are, most of you are academic something-or-the-others, and there has been a longitudinal study that finds the longer you are in the Tea Party, the more racist you become,” he told the group. I say, these are cowardly individuals who feel as though their privilege is about to be taken away from them and of course are blaming African Americans for it. I also say these people need to be psychologically evaluated and given the treatment they so desperately need, beginning with the Koch brothers and working your way on down to folks like Limbaugh, Palin and the rest of the cabal. Monica, if we could have more Republicans like Cyndibru we would be able to govern. She is smart and will not just toe the line of the TP. Their tactics are no different than those used in the Post-Reconstruction South. Then, with fewer states, there were more Blacks in Congress than there are today. I laugh when people try to separate the tea party and the GOP, it’s like separating white from rice…I don’t feel it can be done, the party is evil, and yes, you might say moderate republicans are the lesser of the two evils, but their goals are the same as those of the tea party, they just try to hide/camouflage their true feelings but as confuseddemocrat says in his article quoting Maya Angelou,“ when someone shows you who he is …believe him.” For those who have eyes to see, and ears to hear, and can pay attention, all he/she has to do is monitor the actions of the republican party to understand what I am saying.